The Indian Sanskrit epic Ramayana by Valmiki speaks of a bridge, Setubandhanam, a bridge over the ocean connecting India with Sri Lanka, the land of Ravana, the ruler of men and god. The epic attributes the building of the bridge to the ape army of Rama, who was assisting him in his war against Ravana to win back his wife, Sita. True to the legendary epic a bridge, man made or natural, did exist between Sri Lanka not so long ago, interconnecting Rameswaram Island, off the southeastern coast of Tamil Nadu, India, and Mannar Island, off the northwestern coast of Sri Lanka. Geological evidence suggests that this bridge is a former land connection between India and Sri Lanka, made with chain of limestone shoals surrounded by a shallow sea of one to 10 meter depth. 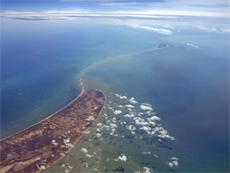 The thirty km long bridge, which separates the Gulf of Mannar from the Palk Strait, was reportedly passable on foot up to the 15th century until storms deepened the channel. 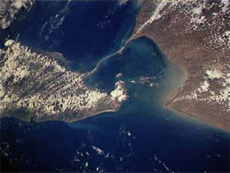 The Rameshwaram temple records suggest that Rama’s Bridge was completely above sea level until it was destroyed in a cyclone in AD 1480. The bridge and its surrounding sea was first mentioned in the western worlds in "historical works in the 9th century" by IbnKhordadbeh in his Book of Roads and Kingdoms in 850 AD; referring to it as Set Bandhai or "Bridge of the Sea". The earliest map that calls this area by the name Adam's bridge was prepared by a British cartographer in 1804, in reference to an Abrahamic myth, in which Adam used the bridge to reach a mountain, which the British identified with Adam's Peak, where he stood repentant on one foot for 1,000 years, leaving a large hollow mark resembling a footprint. Wrapped in legend and historical misjudgments, a diverse range of opinion and confusion exist about the nature and origin of this structure even today. In the 19th century, two prevalent theories explained the formation of the structure. One considered it to be formed by a process of accretion and rising of the land, while the other surmised that it was formed by the breaking away of Sri Lanka from the Indian mainland. In the same confused manner Studies have variously described the structure as a chain of shoals, coral reefs, a ridge formed in the region owing to thinning of the earth's crust, a double tombolo and a sand spit or a series of barrier islands. The age of the bridge had also been calculated as 125,000 years to 3500 years, which incidentally is also the age of the Ramayana. Meanwhile A team from the Centre for Remote Sensing (CRS) of Bharathidasan University, Tiruchi led by Professor S.M. Ramasamy in 2003 claimed that the, "Rama's bridge could only be 3,500 years old" and, "as the carbon dating of the beaches roughly matches the dates of Ramayana, its link to the epic needs to be explored". However, one needs to note that the surveys which have come out with 3500 age for the bridge are based on the studies conducted on corals grown on the bridge itself and it has been argued that this represents only the age of what was measured, which is the corals. The bridge underneath the corals has been dated back to hundreds of thousands of years earlier. A former Director of the Geological Survey of India, S. Badrinarayanan claims that such a natural formation would be impossible; He justifies the same by the presence of loose sands layer under corals for entire stretch as corals normally form above rocks and not over sand layers. Due to its connection with the Legend of Rama and Hindu belief is that the bridge was created by Shri Rama and ShriLakshman with the assistance of Lord Hanuman and the ape army to reach Lanka in order to find Shri Rama's wife Sita who was kidnapped by Ravana, Hindus hold the Adam’s Bridge in reverence, abhorring the Indian government’s proposal to dredge the bridge to create a shipping canal, known as Sethusamudram. 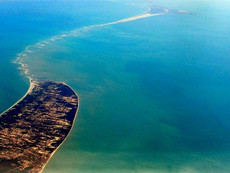 In 2001, the Government of India approved a multi-million dollar Sethusamudram Shipping Canal Project that aims to create a ship channel across the Palk Strait by dredging the shallow ocean floor near Dhanushkodi. The channel is expected to cut over 400 km off the voyage around the island of Sri Lanka. This proposed channel's current alignment requires dredging through Rama's Bridge, a proposal, which was met with strong opposition by the Hindus of India. Contradicting the Hindu sentiment Sri Lankans believe that the bridge was a construction of Ravana himself employing floating rocks, the rocks made of weightless corals, as claimed by Sri Lankan historians hold that the bridge was a collapsible structure made to cross the sea to reach India, when required.